Despite the far-reaching effects of diarrhea on health in the United States and abroad, it appears that clinicians rarely follow distinct patterns in diagnosing and treating acute diarrheal illness. The information available about diarrhea, including the varioeus causes, diagnostic tests, and complexities of treatment, is growing, making the management of acute diarrheal illness potentially challenging for clinicians. A knowledgeable and well-rounded approach to acute diarrheal illness should improve patient outcomes, help minimize antibiotic resistance and unnecessary treatments, and reduce the national burden of disease. 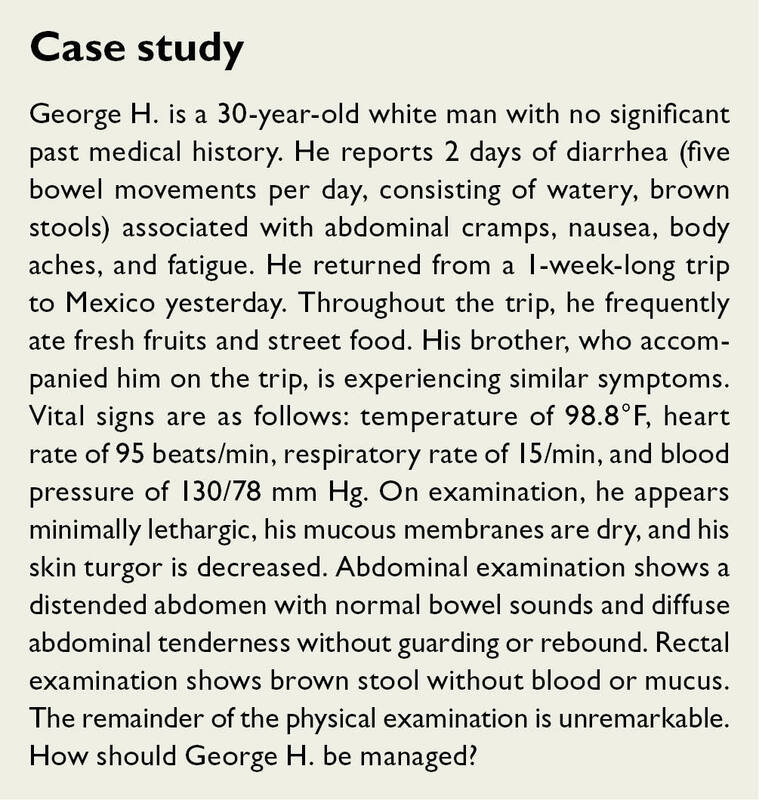 When a patient with diarrhea is encountered, following stabilization if necessary, it is important that the clinician conduct a thorough history to determine the proper workup and diagnosis. According to the Infectious Diseases Society of America (IDSA) practice guidelines for the management of acute diarrhea, the history of the present illness should include information about the stool characteristics, such as the presence of blood, quantity of stool and frequency of passage, how the illness began, its duration, and signs and symptoms of dehydration.9 The patient should also be assessed for associated symptoms, such as fever, abdominal cramping, nausea, and vomiting. Questions should be asked to gain information about the extent of dehydration, such as the degree of thirst and the ability of elderly patients to perform activities of daily living.10 In patients with severe dehydration, fever, or bloody diarrhea, infants, the elderly, and the immunocompromised, the social history is important as well; this information should include any sick contacts, travel history, and activities such as camping, hiking, and swimming in natural ponds or swimming pools. Questions should be asked about diet (specifically the ingestion of undercooked meat, seafood, or raw milk), exposure to animals, time spent in a day care facility or hospital, and recent sexual history. The history should also include questions about medications, especially antibiotic use, other medical conditions, and the past medical history.9 Questions about any family history of gastrointestinal conditions should be asked if a hereditary condition such as inflammatory bowel disease or carcinoma is suspected. This detailed information will provide clues about the cause of the illness and direct the clinician toward an appropriate workup and management plan. The physical examination is critical in assessing the severity of hypovolemia and in ruling out life-threatening conditions. Signs of hypovolemia for which the patient should be evaluated include the pulse and the sitting and standing blood pressures. Other signs include the jugular venous pressure, skin turgor, capillary refill, mucosal dryness, and sunken eye sockets.11 An abdominal examination should be performed on every patient presenting with diarrhea, regardless of its severity. Palpation is critical to determine the presence of peritoneal signs, which can indicate serious conditions or surgical emergencies that sometimes present with diarrhea, including appendicitis, pancreatitis, diverticulitis, ischemic colitis, and adnexitis. A rectal examination is also recommended for every patient to examine the character of the stool.11 This is important especially in elderly patients to compensate for poor historians or patients with poor vision preventing them from detecting the presence of blood in the stool, as an example. Which type of diarrhea cases do you encounter most frequently? The two broad etiological categories of diarrhea are infectious and noninfectious. Infectious diarrhea can be divided into bacterial, viral, and protozoal categories. We will first investigate diarrhea caused by bacteria. Most cases of diarrhea can have many causes but are self-limited, resolve quickly, and rarely undergo a clinical investigation. Even when a case is studied, a specific etiological agent is often not identified. Although most cases have a limited effect on morbidity and mortality, more severe cases require prompt attention. It is then important for the clinician to have a proper differential to avoid unnecessary testing and, when indicated, to initiate proper treatment to minimize the effect of disease. These common bacterial agents of diarrhea can be transmitted in a multitude of ways and present in a variety of patterns, depending on the particular pathogen.